We are proud to offer the most talented professional dancers in the Valley. Each has an extensive resume that includes training by masters in the field and national, even international, performing experience. Whether your event is large or small, the addition of any of our stylized dancers will bring the party alive. Our ballet folklorico groups will add that special flavor of the Southwest. They come dressed in authentic ethnic attire and create an ambiance of the West that your guests will want to take home with them.... "Ole', y Viva la Musica!" Mid-eastern music is set ablaze with belly dancers, which mesmerize your guests. Audience interaction comes to life with the teaching of the dance, after your guests have been amazed at the technique and talent of these dancers. The addition of a trio of classical ballerinas adds the beauty, artistry, and elegance to any corporate event, special occasion or wedding. With technique and strength these beautiful performers delights with power, passion, and perfect exhilaration. Additionally, these gifted dancers can incorporate either the bride and groom, VIPs, or other event attendees into a small snippet of the performance to make this a truly interactive delight. Our contemporary dancers are gifted technicians who perform in the most current style of dance that has been popularized by the hit television show "So You Think You Can Dance." These beautiful entertainers can provide a main show, or can simply add a splash of artistry to any-sized event. Our hip hop dancers are on the cutting edge of this fascinating style. The excitement and power of these urban street dancers creates a charged energy at any event. It's great for highlighting the party and can be presented with a sophisticated, yet edgy pop for corporate events or interactive fun at private parties, Bar and Bat Mitzvahs, and wedding receptions. Our jazz dancers are gifted in all areas of traditional jazz dance. Whether your event requires a traditional jazz, lyrical or musical theater style, our dancers bring their varied experience to provide an exhilarating experience for your guests. They can even serve as dance teachers and get your audience into the act. 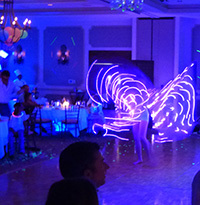 This unusual display of entertainment allows your guests to witness a beautiful LED Glow in the dark dance performance, using hula hoops and illuminated materials. This mysterious art form will mesmerize your group, creating an enchanted presentation of lights, movement and sound and add a wow factor to your corporate event or special occasion. In the Valley of the Sun where palm trees and sunsets flourish, our authentic Polynesian theme transports your guests to the islands. 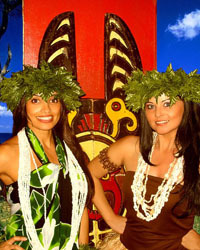 Exciting colorful dances are a visual delight, while the Polynesian sounds provide the ambiance of the Pacific. Samoan, Hawaiian and Tahitian styles are featured throughout the review. These gorgeous samba dancers offer an extravagant performance of the South American Samba. Experience the sheer energy and passion of authentic Brazilian Carnival culture. You will find yourself amazed by the hypnotic sights and sounds of this high-energy experience. Our tap dancers have trained with some of the best artists in the field, including Savion Glover, Mark Goodman, and the Tap Dogs. Their versatility allows a range from traditional Broadway style, to hoofing and beyond. With precision and beautiful rhythms these dancers will astound any audience.